The conservation and preservation message of Disney’s Animal Kingdom is not intended solely for the animals of this planet, but also for the plants and niches of this planet. Keeping the earth, its waterways and landmasses, fertile and inhabitable for all of us is just as much a part of the solution as the ability to bring endangered species back from the brink of extinction. In order to accomplish this, however, we must remember our three R’s: Reduce, Reuse and Recycle. This doesn’t have to mean the process has to be boring. 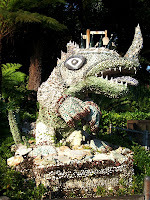 Take, for instance, this sculpture found in Dinoland U.S.A. This fossilerific figure can be found just outside Chester and Hester’s old service station and features two figures, one large dinosaur and another smaller figure. It is the brainchild of the artists known as Mr. Imagination, whose real name is Gregory Warmack. This piece, as with much of Warmack’s artwork, is composed of recyclable materials. Glass bottles, beads from jewelry, scraps of metal, and many other elements were pulled from a life of insignificance and waste in the junkyard by Warmack. While these items may have polluted the earth if left to rot in a dump, here that have been shined up and put on display for all to see and, hopefully, walk away with the message of greener is better. Oh, and for you Hidden Mickey buffs, try finding the One-Year Service Award Pin given to Cast Members. The small, oval-shaped pin features Steamboat Mickey, and can found along the spikes running down the dino’s backside. See, I told you Reducing, Reusing and Recycling could be fun! Never knew about the Service Pin. That's awesome.